Less than a week after filing a suit agains Yves Saint Laurent in April 2011, Christian Louboutin continued his trademark protection battle, this time against the Brazilian footwear company, Carmen Steffens. 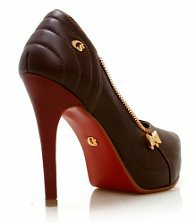 Carmens Steffens shoes retails at around USD 300, whereas Christian Louboutin's at least around USD 1000. Based on the prices, anyone could assume that the market segment is not the same. Louboutin belongs to the high-end, luxury market, whereas Carmen Steffens dwells in a more popular segment. But that was not an issue to Louboutin's and the suit was filed in France, where Carmen Steffens also operates stores. Once again, Louboutin alleges trademark infringement of its red-soles. Carmen Steffens France argued that they have been putting red soles on their shoes since 1996, long before Louboutin's red-sole trademark was granted in the US in 2008. Gabriel Spaniol, International Director of Carmen Steffens states that the red used in their outsoles is the same as their "roseta" logo and that out of a 250 piece collection, only 3 have red outsoles. He adds that they have enough evidence to show that they have been using colored shoes, especially red ones, before Louboutin [in a reference to 2008, when LB's red sole trademark was granted in the US]. A note from Carmen Steffens founder and president, Mario Spaniol, commenting the decision denying Louboutin's preliminary injuction request was published in the American website of the brand: "This is a tremendous victory for consumers worldwide as well as for the overall fashion industry. Since 1993 Carmen Steffens has incorporated almost every range of color into our shoe and handbag designs. We are a Brazilian company and colors and patterns which capture the vibrancy of life are integral to the core of who we are and what we stand for as a fashion brand. Over the years we have included shades of red, blue, green, pink, yellow, brown, black and many other colors into the soles of our shoes. We now have over 200 stores across 16 countries and our customers worldwide expect exotic, fun designs from us that are crafted in exclusive quantities. And, the use of color is a major element of the Carmen Steffens design equation." 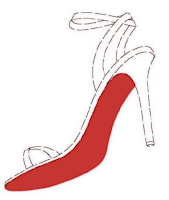 In France, the figurative red-sole trademark pictured below was filed in October 25, 2011, and published in November, 2011. The trademark has not yet been granted, as per the French Patent and Trademark Office database. The trademark is described as the color red (Pantone color code no. 181663TP). Mina I would love to see the proof they have that they have been using the red sole before CL. Oh this news is juicy! Carmen Steffens argues that they have been using red soles on their soles since 1996 and that it can be proved with old catalogues of the company. When they mean that they have been using it before CL, they refer to CL's trademark registration granted in the US in 2008. However, it is public known that LB came up with the red outsole in 1992. Also, the lawsuit was filed in France and not in the US. We shall see it turns out. I suppose that the result of the suit against YSL in the US will surely affect the outcome of the French case.